By now you’ve seen it. The shocking finale to American Horror Story: Asylum. Kit’s alien abduction. Sister Jude’s penance and peaceful goodbye. 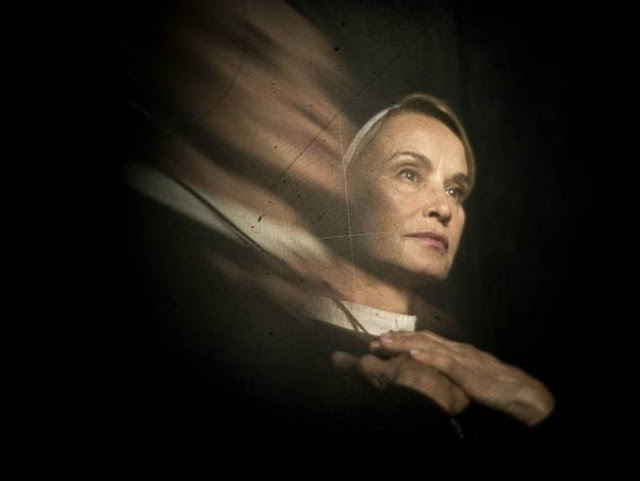 And Lana’s not so sweet reunion with her twisted son, Bloody Face, Jr. At a recent press event, AHS creator talked about the brilliant wrap-up to another haunting season. “The thing that we were the most interested in this season writing about was… the documentary series that [Lana] made about shutting down Briarcliff. That’s one of the first thing with the writers laying on the idea of Asylum, that period of time, those documentaries that were made. There was a very famous documentary that Geraldo Rivera made in that time period, that this is a loose homage of… It’s on YouTube and it’s quite fascinating with Geraldo. It made his career. “It was always what it was. I was always interested in those stories. And the fascinating thing about those stories was the people who claimed to have been abducted and who had been on the ships. Did that happen? I don’t know. But I’m fascinated that those stories started to come out right around the time of the Civil Rights era and I was very interested in the timing of that. So to me that’s what that was about. Stay tuned for more details about Season 3 of American Horror Story on the show’s official website.